The Right to Dissent has been produced to promote human rights and the rule of law through enhancing knowledge of international human rights law guarantees of the rights to participate in public affairs by engaging in public debate, criticism, opposition and dissent. Access to this information by a broad range of users—activists, human rights defenders, journalists and bloggers, police, lawyers and judges, government officials, corporate actors and interested members of the public—will enable people to rely on, jurists to enforce, and state and corporate actors to comply, with international standards. 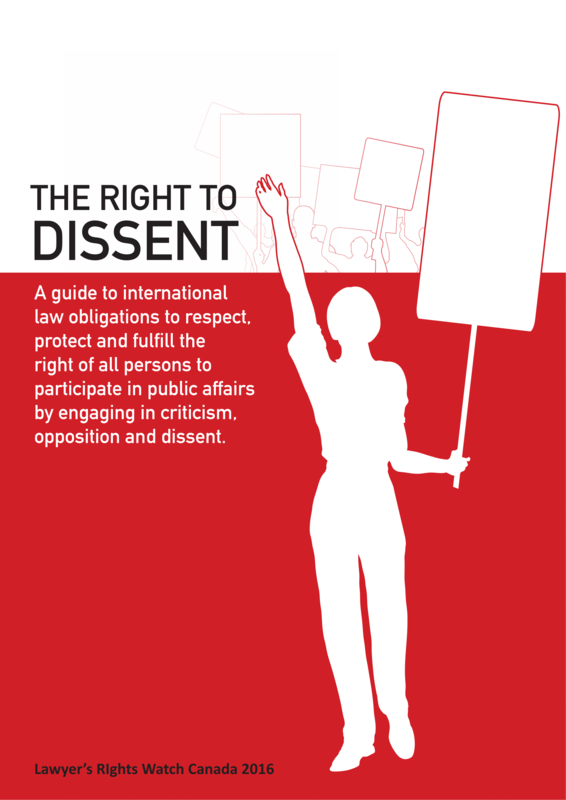 This guide to the Right to Dissent explains the international legal standards and underlying principles and interpretations of the standards that comprise the international legal framework for the right to dissent and protest. The guide includes observations, jurisprudence, comments and recommendations from UN treaty monitoring bodies; opinions and recommendations of Special Procedures of the UN Human Rights Council; and jurisprudence from regional courts and bodies, including the European Court on Human Rights, the Inter-American Court of Human Rights, the Inter-American Commission on Human Rights and the African Commission of Human and Peoples’ Rights.